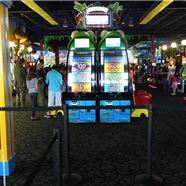 If you’re in the Middletown area and you’ve brought the whole family along with you, one of the best things to check out is The Party Zone USA. This 34,000-square-foot facility is the largest New York party center in the Hudson Valley, so it can be a great place to bring your kids when they’ve behaved during a day trip in the local area, or you could even host your next party there! 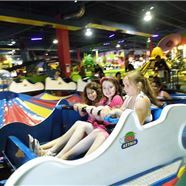 The Party Zone USA is able to put a vast wonderland of fun and games at your fingertips. In fact, there’s so much here that you’ll probably need a few visits to see and experience it all. For a start, make sure you bring all your quarters with you so you can make full use of the bustling arcade. Stocked with a diverse selection of games from the charmingly retro right up to the distinctly cutting-edge, it’s a gamer’s dream. If you’re looking for a chance to let you kids burn off some of their energy, you can turn them loose inside one The Party Zone USA’s inflatable bounce houses. If you’re looking for a chance to indulge your inner cowboy and bring the rodeo to New York, try taking a spin on the mechanical bull. To top things off, enjoy one of the facility’s many exciting rides, including the Banana Squadron rocket ride and the impressive indoor roller coaster. After you’ve taken advantage of some of the attractions listed above, you can sit back and relax with some tasty drinks, snacks, and meals. The Party Zone USA is a great place for families to drop by when they are in the Middletown area, but it’s also played host to numerous events, and it might just make the perfect venue for your upcoming parties. The food is all provided, and the guests will have all the indoor amusements to enjoy. This is a great idea if you need to entertain both adults and children at the same time, and the team at The Party Zone USA can adapt their services to your own particular needs and wants. The Party Zone USA lives up to its name by delivering a heap of party options, as well as catering to smaller visits. It’s just one of the great things to do around Middletown, NY.